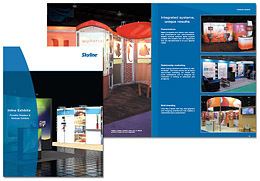 As the entry-level booth size, 10 foot trade show displays are an essential part of exhibitions. But how do you win attendees’ attention away from larger exhibits, or even your plentiful 10 foot neighbors, when you only have a 10 foot space? When you’ve only got a 10 foot trade show display, make the most of it. Load it up with bright colors, bold images, dynamic graphics, and photos or illustrations that will appeal to your buyer. Distill your marketing message to its bare minimum, and then shout it out with a clear, bold, highly visible benefit statement. As your small exhibit may be at a vertical market show with a very specific audience, consider graphic messaging that appeals more directly to that audience. Consider going beyond a cookie-cutter shape, to a more intriguing new shape possible with the latest portable and modular exhibit systems. (Even banner stands can have cool shapes now). And make your booth more inviting by not filling it with stuff, be it too much display, too much product, or too big a table blocking the aisle. When you have an island exhibit, your staff can be large enough to survive with a poor performer or two. But in a 10 foot space, you can’t afford to have any duds. One bad booth staffer can ruin your entire show. So be sure to pick your very best staffers that will relentlessly attract, engage, and convert traffic to your booth. Your small booth space may be at a regional or vertical market industry show, so choose staffers who are local or know the industry, too. Also, your company may be tempted to send only one staffer since “it’s just a 10 foot display.” But if the booth staffing hours are more than a few hours per day, that solidary staffer will start to look like they’ve been in solitary confinement. They’ll project a bad image for your company, and simply take fewer leads. Instead, send a wingman so two staffers can rotate short shifts and stay fresh. Just because you have the smallest booth doesn’t mean you have to have the smallest voice. Get more booth traffic by bumping up the volume on your pre-show and at-show promotions. Before the show even starts, offer attendees (via email, mail, phone, ads, and social media) a compelling reason to visit your booth. Once you’re at the show, pull out all the stops. Putting giveaways within reach of the aisle? Offer more valuable and eye-catching premiums (but pay attention to the trick-or-treaters, and be ready to start conversations with visitors). Giving away a prize? Offer a more valuable prize than other exhibitors. Enticing visitors with a show special or discount? Knock another 5 or 10 percent off your usual offer. Demonstrating your product? Demo it in a more visually-arresting fashion to get people to stop, look, and enter your booth. A long line of ten foot exhibits creates a gauntlet-like effect for attendees, dulling their senses as they walk down the aisle. Because the 10 foot exhibit space is by far the most common at trade shows (our data says about 6 in 10 spaces), virtually every exhibitors use them at one time or another. But you can still stand out from the pack. Focus on your exhibit design, booth staffers, and trade show promotions, and your 10 foot display will be the David to your neighboring Goliaths. 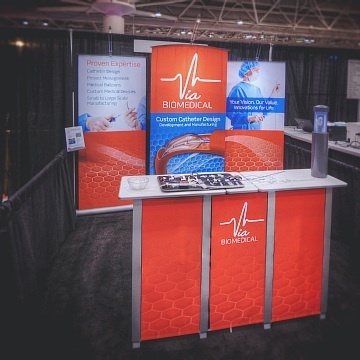 From eye-catching, easy to set up displays to architecturally sophisticated structural modular exhibits, a 10 foot booth can improve your trade show results. Get more info and see examples in our Inline Exhibits brochure. Complete the form to request your free 26-page copy.